Safety • Deadly nerve agent had been mislabeled after testing. 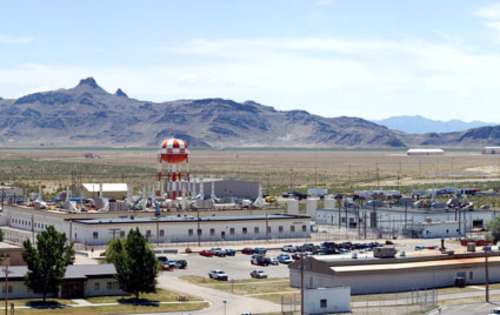 Dugway Proving Ground • A labeling mistake on a tiny vial of the deadly VX nerve agent triggered an overnight lockdown at the Army' sprawling 801,000-acre Dugway Proving Ground chemical testing base. 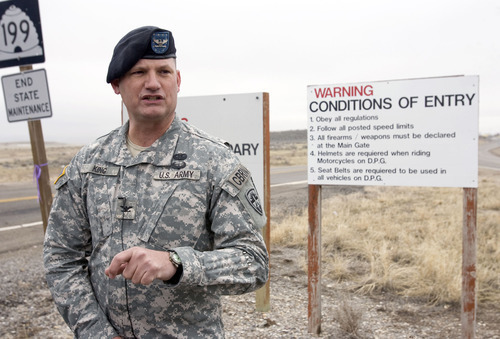 "What we deal with is very, very dangerous material," said Dugway commander Col. William King. "Quite frankly, we take it very seriously." Wednesday, a routine inspection turned up what appeared to be a missing vial containing less than 1 milliliter, or less than a quarter-teaspoon, of VX. 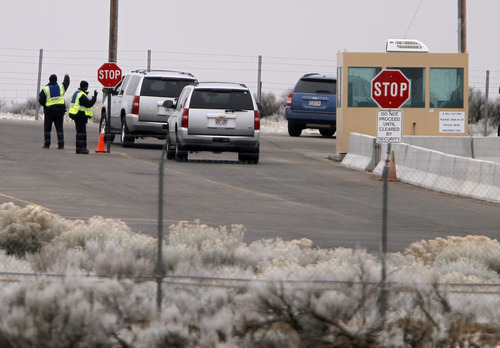 Officials at the remote Army installation, 90 miles southwest of Salt Lake City in Utah's western desert, abruptly ordered gates closed at 5:24 p.m. Wednesday. 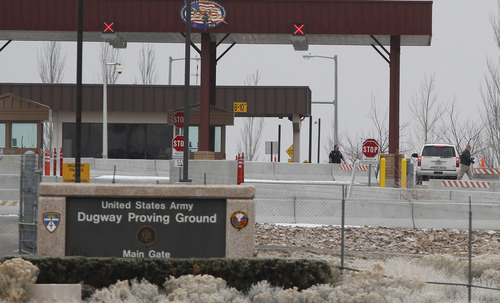 Up to 2,200 people at Dugway  military personnel, contractors and civilian workers  were forced to stay the night, with some exceptions for people who were searched and cleared by name. The vial was discovered intact about 3 a.m. Thursday, King said. 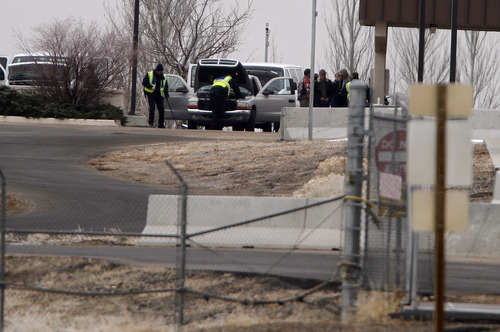 The lockdown was lifted about four hours later, though inspection of vehicles leaving the base continued until about 10:30 a.m. The error happened Tuesday, when two testers swathed in protective gear removed the agent from storage to test sensor equipment, King said. When they recovered the oily, amber-colored liquid, they put it back in the wrong vial. "There was no malicious intent. This was simply an administrative error," he said. According to the Centers for Disease Control and Prevention, VX is within a family of toxic and potentially deadly chemical warfare nerve agents. Severe VX exposure can induce convulsions and respiratory failure. VX is not the most deadly nerve agent on the base, King said, but "if it was to get on you, it would be very deadly." Both the military and the FBI are investigating, and all chemical testing on the base has been halted as commanders review their procedures to prevent it from happening again, King said. He could not immediately say whether anyone will face disciplinary action. Dugway houses small amounts of various chemical and biological warfare agents for defense testing purposes; it also is a prime Army base for testing of an array of conventional military weaponry and ammunition. Dugway also serves as a training site for Army Special Forces and Reserve and National Guard units and encompasses expansive swatches of wastelands used for bombing and tactics training by fighter jets based at Hill Air Force Base. The mistake and subsequent lockdown "reminds us that what we do is a deadly business,"King said.